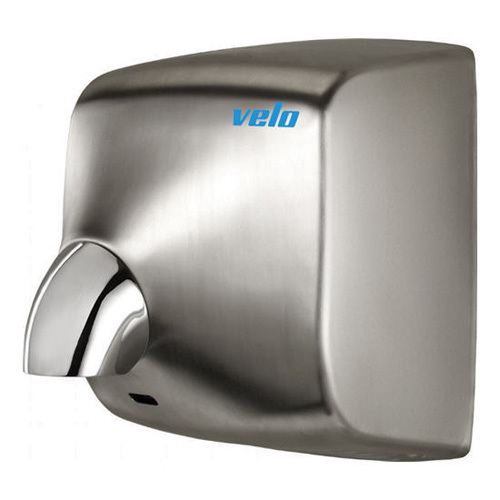 The Velo Windflow hand dryer is a one of the best conventional hand dryers in the market and offers high performance and very quiet. It is a high quality machine and best suited to high traffic areas that include hotels, airports, clubs, offices and cinemas. Operation: Electronic automatic infra-red sensor. Dimensions: 280 x 280 x 210 mm. Approximate drying time: 20 seconds. Casing: AISI 304 Stainless Steel 1.5 mm thickness. Voltage / Frequency: 220 – 240 V 50/60 Hz. Sound level at 2m. : 70 dB. Airflow: 7.767 l/min. (466 m3/h). Temperature at 10 cm. (room temperature approx. 21ºC): 55 ºC. Protection rating against water projections: IP23.